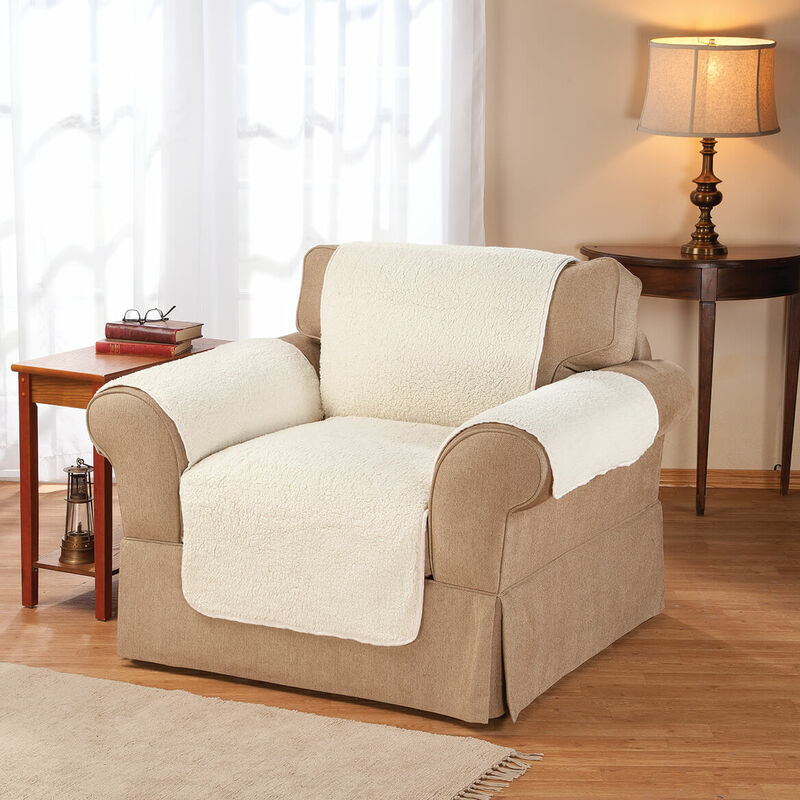 To protect a spanking brand new chair in a household full of cats and children, it seems the perfect answer for protecting the chair as well as adding softness and warmth. Fit the chair perfectly and matched all the colors in the room. Great protection for a new chair, or great cover for a an older chair showing ware. Love the Chair Cover. It is so soft and comfortable plus the fact that I ordered another the wrong color and am awaiting for the company to replace the one I returned. Miles Kimball is a good company to deal with. Look forward to buying other things when needed. We love the chair cover. However we ordered a second cover but it was the wrong color and I returned it a week ago and was wondering how soon i would get my replacement (neutral). We love the covers and are waiting to get the other one to match both of our chairs. It serves the purpose of protecting the furniture. It stays on the furniture securely. I have a favorite upholstered chair, that also happens to be my dog's favorite! These covers can be pricey, so I was grateful to find one in a fabric and color that work perfectly for a real deal! 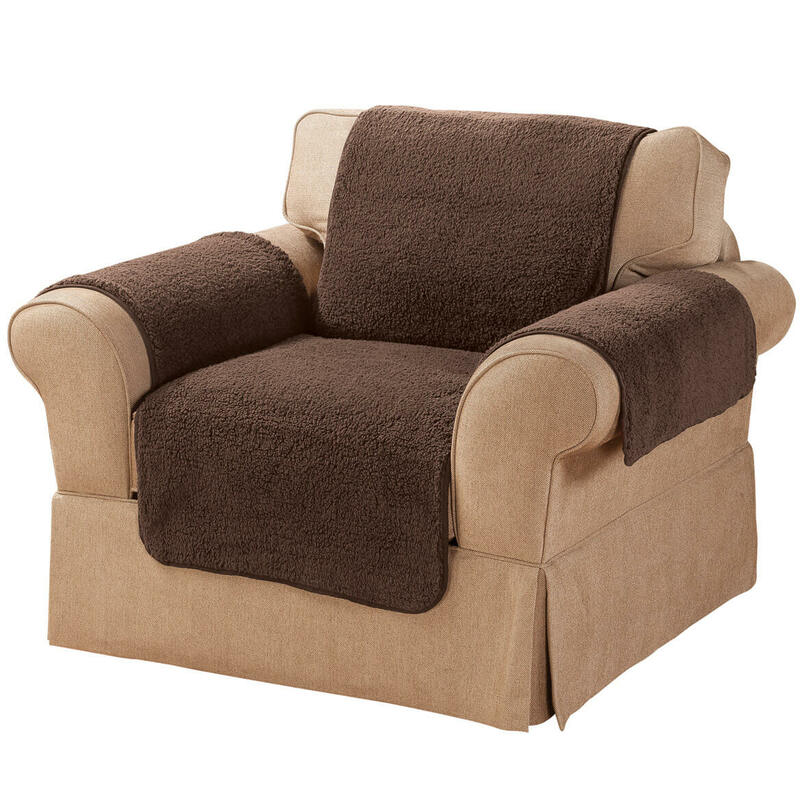 Don't be afraid of the sherpa, as it hasn't shed so far and adds some softness to my chair. Also, it is easy to clean! We purchased 2 of these chair covers to put on a new chair the kitty likes to sleep on. It does cover the chair but when we washed according to instructions in the washing machine on gentle cycle and put put it in dryer on gentle it came out with lots of yarn like pieces sticking out all over it. It looks like will not hold up under another washing or two. The cover does not stay y place, it needs re-arrangement every time we sit down, therefore it does not fulfill its service. I would not buy this product again!!! Product is not very poorly made. Flimsy material and did not fit my chair properly. These were pathetic to say the least. The size, the quality were horrible. I wouldn't purchase another thing from your company. We liked the quality of the Sherpa Protector. I picked this cover to protect my chair. 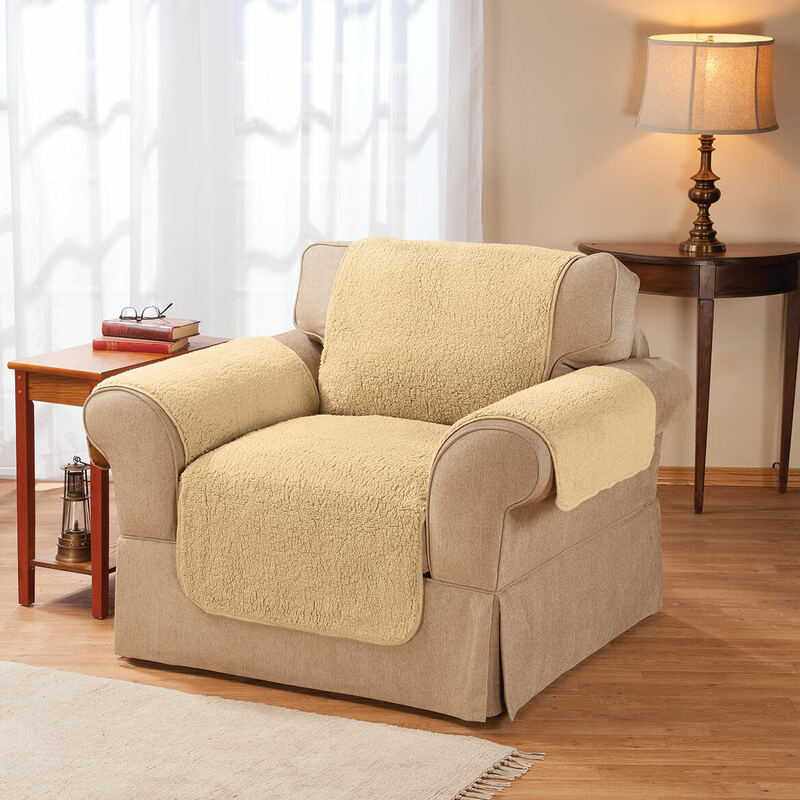 My husband loves his sherpa throw blanket and often puts it in his easy chair or office chair. 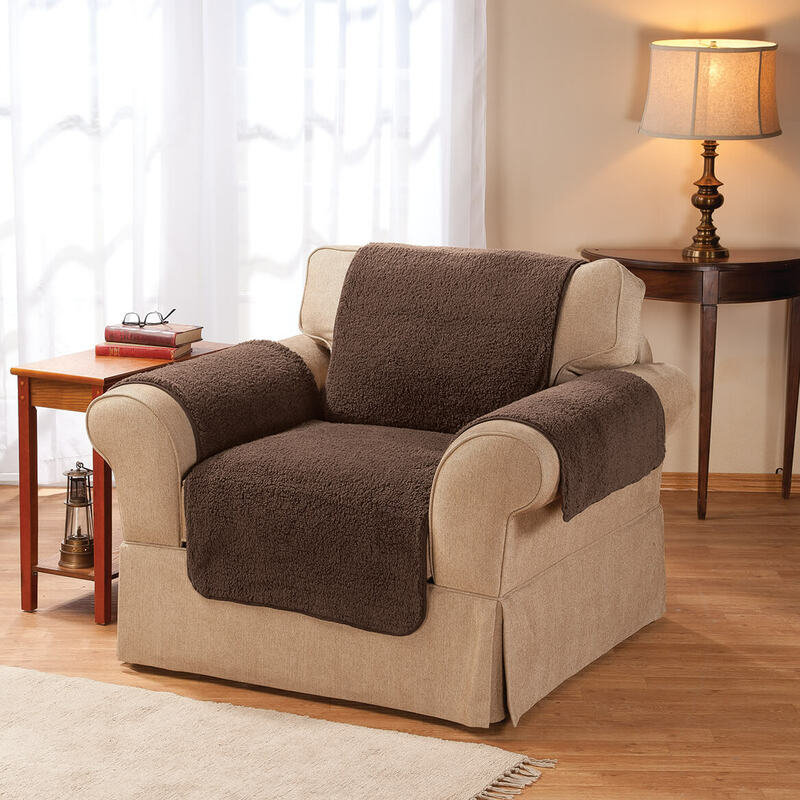 I was looking for something to stay put in his chair and look a bit nicer than the blanket! I have a cat and I need protection for my chair. It was exactly what I was looking for at a fair price. I chose this item to protect my chair from normal wear and tear. Also, the material appears to be very cozy for snuggling into at the end of a busy day. Have another one in Burgundy, just need a quick throw for chair cover if my cats decide to get into chairs. I hope this purchase does what it says . Time will tell. I liked the way it protects your furniture, if it looks good when it arrives I will probably order another one. 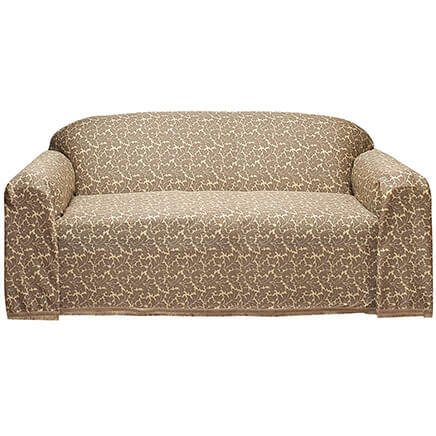 I got one the same color for my sofa, so I'm getting this to protect my chair and to match the sofa. To help keep my chair clean. Reasonable price, and it's machine washable. 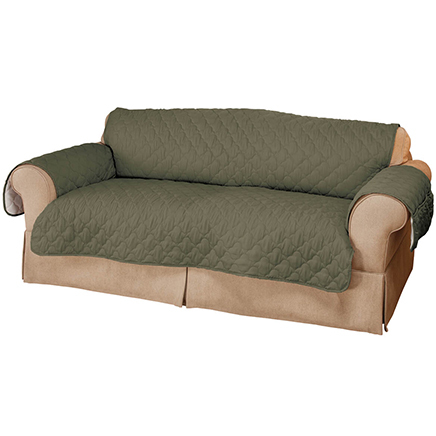 Size, color, price.....have something similar for my loveseat and it's great for my dogs. Washes easy, doesn't shrink, doesn't tear up from dog nails, etc. I needed a chair cover. To cover our chairs that our kitty likes to sleep on. Acquired used chairs and wanted to cover worn spots. I need to protect my good chair from cat fur. I've used them before. They offer protection from our dog sitting in HER favorite chair. I can remove them when company comes and not worry about them sitting in dog hair. They appear to be an excellent protector for my furniture. I needed covers for my chair and this look pretty good. Do the arm covers come with, as a part of a set of 3 pieces? BEST ANSWER: This chair cover is all one piece, arms included. Spread out, picture it as a large plus sign. 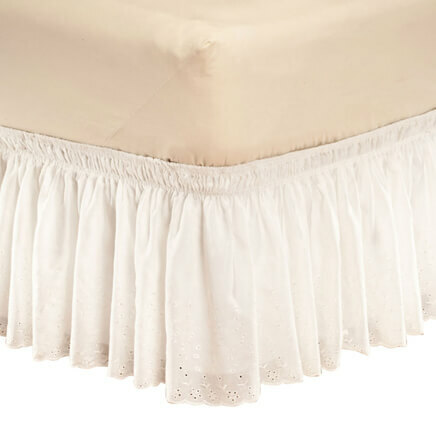 The underside has tabs on the seams to help tuck it into the cushion sides - something I find helpful and is on most furniture covers. But like most furniture covers, it shifts a little with movement so I use mattress pins to secure my covers. Using the screw-in mattress pins has not harmed my chairs. I screw 2 pins under each chair arm, and 2 or 3 pins on the back of the chair to secure the cover. I don't bother pinning the bottom of the cover. The fabric is a little thin but it's very soft. I am pleased with it. So is my Pomeranian. I hope that helps! Thank you for your question. This is a one piece set. We hope this information will be of help to you. Is this product recommended for leather furniture? BEST ANSWER: Thank you for your question. 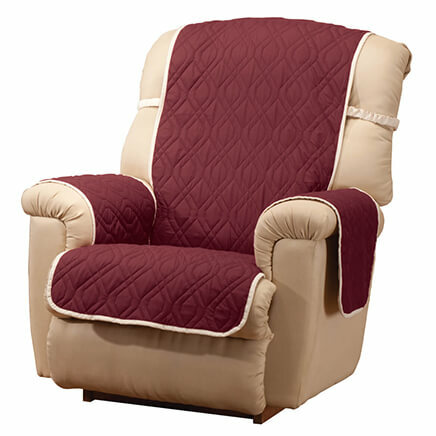 This item is able to be used on leather furniture. We hope this information will be of help to you. I think it would be too slippery. can this be used to cover an electric lift chair? BEST ANSWER: Thank you for your question. 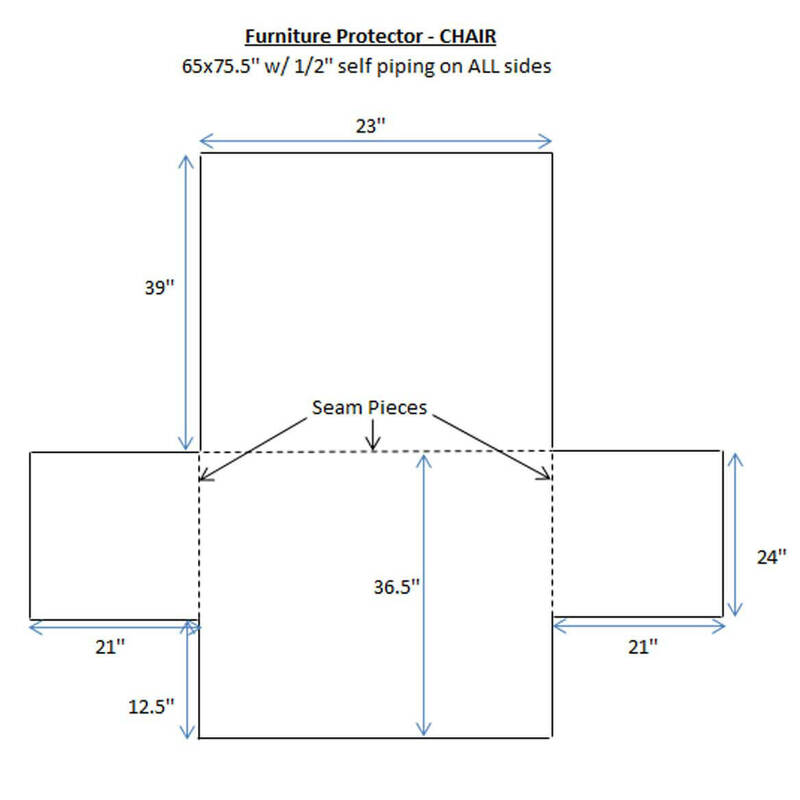 We suggest to measure the chair that you are looking to use the Sherpa Chair Protector with to be sure that the measurements will work with your chair.. 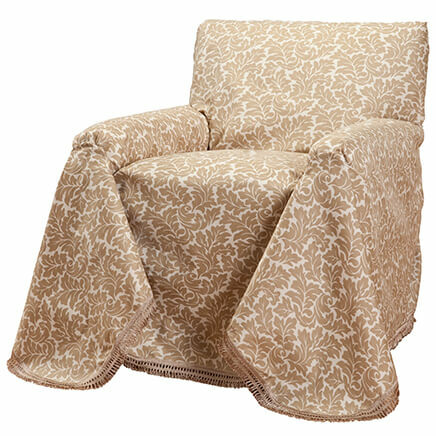 The Sherpa Chair Protector measures 75 1/2" long x 65" wide. We hope this information will be of help to you. BEST ANSWER: Thank you for your question. Right now Navy is on backorder, but tentatively will be available again in June. We suggest checking back at that time. We hope this information will be of help to you.